Self made individuals have the charisma to go the extra mile . Be one who influences and not instigates, be one who is pure and not prejudiced with focus on your character and not just charisma, with focus on truth and not just talent, and you will see how lives are impacted. Beauty is the opposite of perfection - it's about confidence, charisma, and character. Charisma. You can't buy it, you can't make it. And you sure can't fake it. New concepts should be introduced by the power of imagery. "There can be no power without mystery. There must always be a 'something' which others cannot altogether fathom, which puzzles them, stirs them, and rivets their attention.... Nothing more enhances authority than silence. It is the crowning virtue of the strong, the refuge of the weak, the modesty of the proud, the pride of the humble, the prudence of the wise, and the sense of fools. Mix a little mystery with everything, for mystery arouses veneration. Charisma is a gift of god and if utilized in the proper way, can be beneficial for others too like, there are certain leaders who have led the whole country with a great mass appeal only because of charisma. 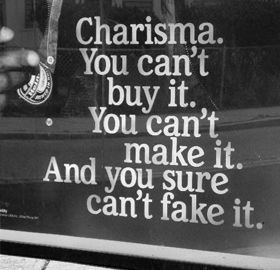 Charisma is, in fact, essential to be a great leader. But charisma is not external. It is the exuberance of confidence. Ricky Gervais says, “You can get away with bad material if you have got charisma “. But it is not possible to get along with charisma alone as your self defense because when others think that your charisma has drained out, only the real substance will remain. And if the substance is not solid enough to convince others, it becomes a dangerous situation. True, there are always a group of people who run after charisma but if it is coupled with pure ingenuity, the value will be more. Share these quotes on charisma with others.